...But progress is still being made and saved. Not anymore since 22:10 CET. we did have some 50% referral bonus credits and XP up to that point, but that stopped now too. My recruit hasn't played for the last 60 days. Will he be able to receive invitation and play or I will have to find another one? That is, unless they have a very strange meaning behind that "have not completed any Recruit Contracts"... Like if just being part of the old system would count as completing an RC. Which would be really uncool. Is it now possible to recruit someone who already has a Wargaming Account but only played WoWs or Warplanes til now? It didnt work with the old referral program, but support could never tell me why. They always said that i would need to wait for program 2.0. So: Is it possible now? Or does the recruiter still need a complete new Wargaming Account with a new email adress? I think that old behaviour was because in Recruiting 1.0 any login counted as activity. The way i read the rules for v2.0 only fighting a battle will now count, so you should be good. Except those 60 days were counted from an absurdly old cut-off date... Thankfully, they apparently fixed that silly restriction now. Because the old program will cease to exist entirely. - How many times can a commander get a reward tank? Is it once per account or once per recruit? - Can the same player be first a recruit, get a reward tank, and then be a commander, and get a reward tank again? Can eekeeboo please answer that second part? The old 1.0 rules forbade someone from being both a recruit and later a commander, iirc, but the new rules would suggest this is now allowed. Can we get an answer for this? NOTE: When playing as a Platoon with your Recruit, the Commander will receive 50% more Credits and XP per battle and the Recruit will receive 100% more XP and Credits. If the Recruit plays alone, there is still a bonus – 50% more XP and Credits. And give people a chance to get the tanks via taking part in the new referral program? Changed! I've double checked and you should be able to receive either 2 tanks or tanks and credits. Basically, a reward for each time the 3 stages are completed in the season. If it wasn't complicated and completely different, it would have been done. But things are so vastly different between 2 the programs and the way they work that it is not possible to carry over. 1. That phrasing was... unrefined, to put it mildly. I've have to read it like 3 times over, and i still am not sure i got what you were trying to say. Did you maybe mean that the Т95Е2 owners can also benefit from the new program, so there's no reason to bring their old reward up to the current par? 2. "Player has not yet completed any Recruit Contracts"
Does this mean that a player that has once been a recruit can never ever be a recruit again? 4. "Player has never been and is not a Commander at the moment"
Does this mean that a player that has once been a commander can never ever be a a recruit again? The reason I'm asking is because let's say that a player takes a break for 60 days, and then wants to come back into the game again. Does this mean that if this player has brought in recruits in the past, he can not be a recruit himself, despite that he has not played any battles for 60 days? Also, how come that commanders are not allowed to pick a tier 6-7 tank from the recruit reward list? I mean the value of those tanks is lower so why not? And indeed, that last point would make sense. Hope they accept the idea. If I invite a player that hasn't played for 60 days and he becomes my recruit and we get the premium rewards, will he ever be able to become a commander? Or once you are a recruit you will be a recruit for ever? The wording in the rules would suggest that such a thing is possible. What seems to be restricted is for the same account to be a recruit multiple times, or for someone to be a commander and afterwards to go inactive and then be recruited. Edited by CrystyB, 06 February 2019 - 10:55 PM. hm, maybe. But even when there was no login, it wasnt possible. It seemed like a login in WoWs or having a WoWs account was enough, so you couldnt be a recruit or a commander. Edited by CrystyB, 06 February 2019 - 11:05 PM. any1 know is it possible to end contract, and if it is posiblle how? The video at the top of the FULL REGULATIONS document has some details ( after 3:11 )... You can just "right click the card", either as commander (recruiter), or recruit. -- Note that this might have undesired effects if you've completed the first stage of the contract. Edited by CrystyB, 06 February 2019 - 11:25 PM. When this gonna work?? And why you added to game something that is not working?? Nothing, but if you want fully used potential of the new programme you have to find someone who will platoon with you on your primary account. In the previous version, we were able to grind whole new stock T9 to T10 in 2 days (with nonstop playing you can do it within one day) and you had a bonus also on primary account = you grind 2 lines parallelly. I doubt many people could grind a stock t9 to t10 in two days. Perhaps if they are in a clan with some good activation bonuses. The best way to grind the old tank was for you to find someone else who wanted said reward and then grind it out using the bonuses doing your normal grind. It was actually FASTER (In Hours) to use the old system for two people to grind lines (with disposable accounts) than it was to just play solo. This new one gives much lower XP rewards, BUT it looks to be much faster to get your free goodies (when in platoon). the interface works again, only the 100% cred xp bonus for cadets still doesnt work. Will they give it afterwards? I need help. How can i get the link only of FACEBOOK ??? or there is another way. Where to clik to generate link?? Im i doing somethink wrong ? So yesterday I invited a friend who wasnt active for about 3 years. He accepted and joined but nothing happened What shall I do? Can you please help: My recruit and i don't get the +50% XP- and Credit-Bonus (when he is playing alone), neither the +100% (respectively +50% for me) when we play together in a platoon. We only get the normal +50% with Premium-Account. Am i doing something wrong? Seems like there is nobody else with this bug. Edited by Grobsen, 07 February 2019 - 12:44 PM. I have 4 of the first 5 tanks and do not want nor need the 5th so I cant really be bothered to invite anyone. And when they are all just plain tier 8 premium tanks we can also just buy I see no point in creating a new acount ot invite another player. There is nothing in it for me. The idea to get something special was the good part of the first referal program, and there are plenty of tanks already in the gamefiles who would fit in better. And my question is... i had 1 recruit in 1.0 program and i already have in my garage the T95E2... so, now in 2.0 program, can i stop for 60 days to be a recruit?? or i will never can be a recruit at this point?? ​you could technically be a recruit after a prolonged absence. Which part is not working anymore and did you submit a ticket? That person will be able to become a recruiter eventually. There are seasons to also take into account. If your old program has a stagnated progress and is not being used, then it is no longer fit for purpose, if everyone has the T95E2, people have no desire to have a new recruit, vs the chance to pick your own premium from a pool of tanks that will change for each season. The two systems work VERY differently and cannot co-exist at all. It was highlighted many times, the old program is dead, it will not have any carry over to the new program at all. The owners of the T95E2 are eligble to recruit new players just as they were previously, the buffing of the tank has nothing to do with the program at all, in any way. You're able to answer many of your own questions by reading the complete documentation and text in the game. 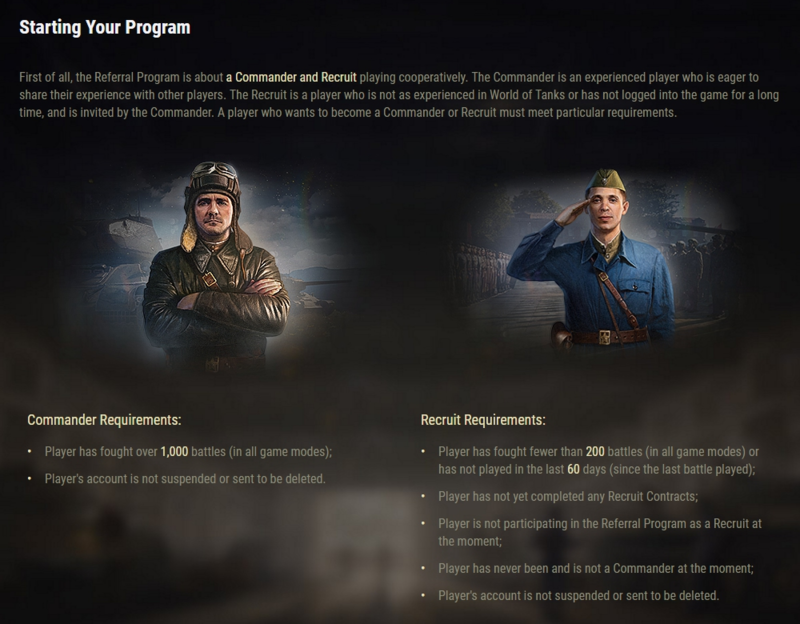 The program runs in seasons where a person's status will be reset at the end of a season and things start again, this is mentioned in game and should highlight a person earns a tank as a recruit, becomes an experienced tanker, when the season ends, is able to recruit someone new when the next season starts. There a Facebook button, Twitter button and a copy link button. When i press copy link button noting hapen.Where the link go how can i copy paste to someone. They totally can coexist, but it's just that the effort to make that happen might not be worth the benefits. Again, probably understandable. Except by people that feel cheated by the ending of the old program. Even though the rules explicitly say that in order to qualify as a recruit, a player should have "never been [...] a Commander"?! And i later added a related question, whether "having been a commander or a recruit in v1.0 would count for these points... :-s" ... specifically: can a player that has been a recruit in 1.0 still be a recruit in 2.0 too? Because those conditions in the screenshot seem more restrictive (and arguably less clear) than what has been said in the news post(s). And i expanded their question with "HOW LONG will the recruit benefit from that bonus?" 2) if i do the reward and i get my tier 8 tank , when there will be more rewards do i get to choose more if i do it again or i take reward just once and thats it .